Secluded cottage w/private dock on pristine lake. Walk to golf & tennis. Secluded lakefront cottage w/ private dock on China Pond in the Sedgewood Club One hour drive from Upper Westside. Enjoy swimming and fishing in pristine spring fed waters (no motorboats). Private golf course (no tee times) and clay tennis courts available on Club premises. Charming Adirondack style cottage has two bedrooms, 1 bath, sitting room, living room, dining room plus all season sunroom and 2 decks overlooking lake. One hour from Upper Westside at the end of a private country road. Serenely quiet and relaxing. Dine alfresco overlooking your private dock and clear blue lake. Accessible by Metro North train or car. Commute to work and come home to swim, golf, tennis or just relax on deck overlooking lake. September is glorious. Still warm enough to swim and enjoy lake activities. View the fabulous Fall foliage from the chairs on your private dock and decks. Minimum Stay: Available for MINIMUM of 1 week at $1,575 per week. Remote Adirondack feel 60 miles from NYC. Quiet and peaceful. Beautiful fall foliage. Village of Cold Spring has many fine restaurants, antique shops and local craft shops. The Sedgewood Club has a private beach for residents with swimming area for children. It is located across the lake from the house. Walk or short ride to first tee. No tee times. Play whenever YOU want. Private dock on the property with kayak and boat. Excellent fishing. Crystal clear lake, quiet and peaceful. No motor boats allowed. Water views from master bedroom, living room, kitchen and dining room and all decks. walk down steps to private dock on spring fed lake. Rowboat and kayaks included. No motor boats allowed on lake maintaining a quiet, calm atmosphere. Cathedral ceiling, wood burning fireplace, leads to enclosed porch and outdoor deck. glass enclosed dining room overlooking lake and woods. enclosed screened porch leads to outdoor deck. Deck has table and chairs for outdoor dining. membership available in private club which includes access (no tee times) to course. No motorboats allowed on lake. Kayak and row boat provided. Clear, clean spring fed mountain lake. Excellent fishing. Catch and eat! Fabulous fall foliage. Golf and tennis available on club premises. Perfect 3 week stay for us! My husband and I travelled from England to stay in this lovely cottage set in beautiful woodlands with a private dock on a small, very peaceful lake. It was so quiet, sometimes we would awake and not hear a single sound, not even the birds. The cottage is spacious, comfortable with gorgeous views out every window as well as the necessary modern amenities of wifi, flat screen television and laundry facilities. Our favourite spots for sitting for hours relaxing with friends or family or just each other was either on the deck looking out at the lake and the forest around us or down on the private dock dangling our feet in the lake. The swimming and kayaking were also wonderful ways to enjoy the lake. We also enjoyed visiting our son in New York City (very easy to get to) and the sights in the surrounding area which were all less than an hour drive including the homes of Franklin D Roosevelt, the Vanderbilt's and the Rockefeller's (Kykuit Estate). Two art centres were also on our list which we were happy not to miss, namely Storm King Art Centre and the Dia Art Gallery in Beacon. This area is a beautiful very wooded region with many reservoirs, and only a short drive from the magnificent Hudson River. This cottage ticked all of our boxes for a perfect vacation combining a peaceful secluded cottage with easy access to New York City and interesting places to visit. Susan and Larry Feldman were very kind and helpful, and we are very pleased we chose their cottage for our USA vacation. Many thanks to them for helping us make some wonderful memories. What a wonderful month we recently spent on China Pond. My wife and I rented the spacious 2+ bedroom 1 bath cabin overlooking China Pond. Arrived early August and left on the 28th. We had planned on traveling to NYC a few times during our stay. We had such a great relaxing time that we never left during our stay and didn’t want to leave in the end. The home was clean, cozy and roomy for a 2 bedroom. The room outside of our bedroom, which was at the top of the cabin could also accommodate guests. There were only the two of us and we had invited guests over the weekend twice. Everyone loved the quiet, quaint, cozy feeling. All the pictures on the VRBO site accurately picture the cottage. There were kayaks, a row boat and we borrowed the neighbor’s stand up paddle board. My wife swam the lake daily and really enjoyed the warm spring fed water. It was so clear … you could see the sun fish swimming below the surface and all the way to the bottom. We had wonderful weather and even when it rained occasionally it felt great to stay inside and watch the water come down onto the deck. It was an easy walk down 75 wooden stairs in the woods to your own private dock. That was my exercise, however my wife enjoyed swimming daily. The other nice part was we were far away from civilization to see the stars clearly at night but close enough to the nice nearby towns to enjoy some great meals and obtain everything we needed for the month. Golf was enjoyable on the course nearby and although we could have enjoyed the beach house that is part of Sedgewood, we chose just to paddle by and wave at the beach goers. I can’t thank Larry and his wife Susan enough for their warm welcome and their honesty. For three summers, in 2012, 2014, and 2015, we have had the opportunity to spend a few weeks of vacation time at this lovely cottage in the woods! The peaceful location and serene environment was both refreshing and reinvigorating, was just what we needed and was more than we had hoped for. On the outside the cottage seemed small, but easily accommodated visiting family. As advertised, there are quite a few stairs to get to the lake, stairs at entrance, and stairs to the upstairs bedroom, all of which we viewed as health benefit. A typical day for us would include waking up to the beautiful sounds of the forest, breakfast coffee down on the dock at the lake, a morning hike along the area’s many wooded paths where deer can be spotted almost daily, an afternoon swim in the crystal clear lake, and an evening drink on the outdoor patio. During our stay, among the many things nearby that we usually enjoyed were: walking on the scenic Appalachian Trail, visiting the beautiful Chuang Yen Monastery, the historic Boscobel House in Garrison, the picturesque Stonecrop Gardens, and shopping in nearby Cold Spring on the Hudson River. And catch a train from Cold Spring or Garrison and you are in NYC in 50 minutes! Our visiting grandchildren especially enjoyed fishing, swimming, and boating in the lake off the dock or at the beach. Two outdoor deck areas and an enclosed lanai (great for rainy days) easily accommodated visiting friends and family. We slept in a comfortable large bed in the upstairs bedroom which has an adjacent small room with a convertible couch - just perfect for our young granddaughter who wanted to sleep nearby. Downstairs near the bathroom is an additional bedroom. The small kitchen is remarkably well-equipped for cooking and the dining room is spectacular with large windows surrounded by trees. Most important: the cottage is spotlessly clean and comfortable. The owners, Susan and Larry are easily accessible, helpful and pleasant. The little touches like welcome notes, and herbs growing in patio pots for us to use (my granddaughter learned to make basil lemonade), flowers in the kitchen, were very much appreciated. Larry and Susan made us feel welcome from the very first visit and we highly recommend their China Pond Cottage. 1 hour from the Upper Westside is a charming secluded cottage in an Adirondack like setting. Located in the Sedgewood Club which has a private golf course (no tee times just walk on and play) and clay tennis courts available for additional fee. Enjoy swimming and fishing from your private dock on China Pond. Cottage has 3 decks all overlooking lake. Located between Cold Springs and Carmel the house is accessible by car or Metro North Brewster Station. Commute to work and come home to swim, golf or tennis. Cold Springs has interesting restaurants and antique shops. Visit West Point, Hyde Park Roosevelt Estate, Boscobel Shakespeare Festival, Caramoor Performing Arts Center, Dia, Beacon, Kykuit Rockefeller Estate, Chuang Yen Buddhist Monastery, Lyndhurst Castle, historic Cold Springs. 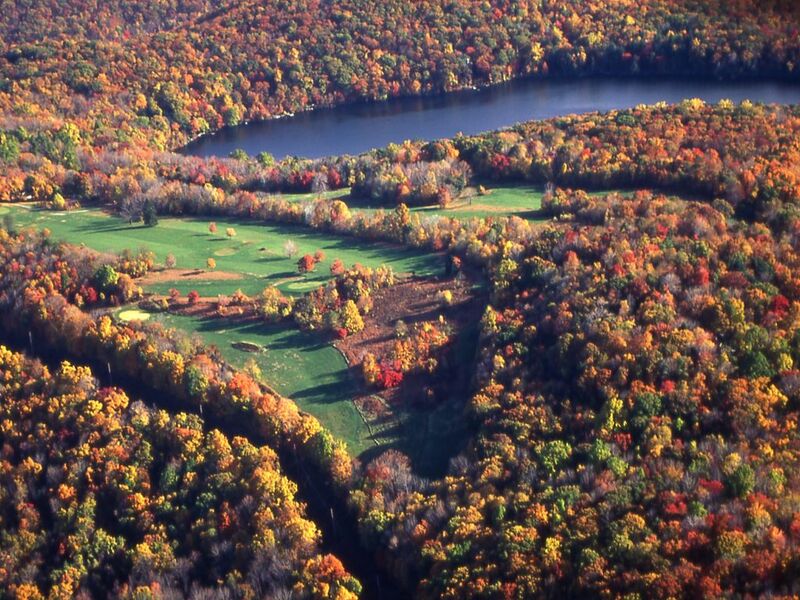 Golf: Sedgewood Club is a private golf club.